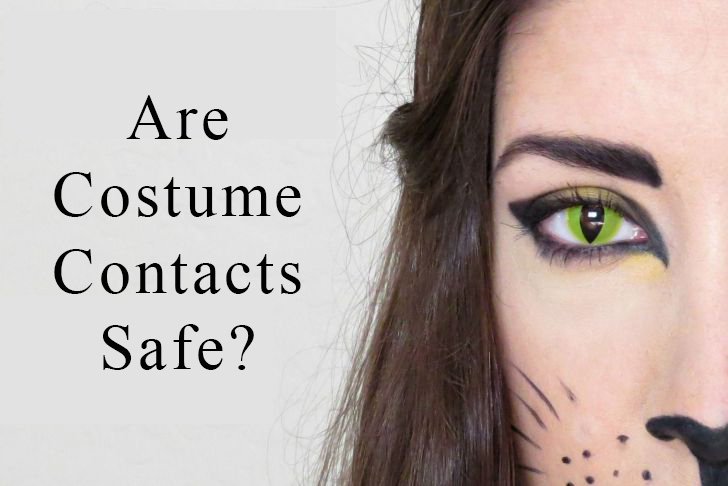 Scary-looking costume contact lenses may elevate your Halloween’s fright factor but wearing them without a prescription could result in something far more terrifying—blindness. The doctors at Grin Eye Care join the American Academy of Ophthalmology in ensuring our patients understand the risks of wearing over-the-counter contact lenses. It is illegal to sell non-prescription contact lenses, but they can still be easily purchased at beauty supply stores, costume shops and online. Falsely advertised as “one size fits all” or “no prescription necessary”, these lenses can cause serious eye damage. SCRATCHES TO THE EYE – If contacts are not professionally fitted to your eye, they can scratch the clear front window of the eye. This is called a corneal abrasion, which is not only painful, but can cause permanent damage including infection, scarring and permanent vision loss. INFECTION – Research shows wearing non-prescription contacts increases the risk of infection by 16 times! Early treatment with antibiotic or steroid eye drops may preserve vision, but sometimes surgery is necessary. These types of infections can also be extremely painful and lead to permanent vision loss. PINK EYE – Never share contacts. Doing so can spread germs and lead to conjunctivitis (commonly known as pink eye). DECREASED VISION – Whether from a corneal abrasion (scratch) or infection, wearing non-prescription contacts can lead to decreased vision and possible permanent vision loss. BLINDESS – It’s no scare tactic; wearing non-prescription contacts can lead to permanent vision loss. Check out our previous blog post on how to take proper care of your contact lenses to avoid dangerous eye infections. If you or someone you know are looking for some fun colored contact lenses this Halloween, call us today to make an appointment with one of our board certified and experienced doctors. We can fit you with the perfect lens to keep your eyes happy, healthy and safe.